Malindi Elmore and Sasha Gollish ran huge marathon debuts this morning in Houston. Elmore finished seventh in 2:32:11 and Gollish finished eighth in 2:32:52. Elmore is a former 1,500m stud with a lifetime personal best of 4:02.64, one of the fastest times ever run by a Canadian woman. She’s currently a coach and triathlete. Gollish also comes from a 1,500m background. She’s the 2015 Pan Am bronze medallist at the distance, with a lifetime personal best of 4:07.08. Gollish attempted a marathon debut at Berlin in the fall but unfortunately didn’t complete it. In June of 2018 she announced that she would be running the marathon with the motto of “testing herself,” and Berlin certainly tested the track-turned-road runner. According to Strava, Gollish made it to 31.04 kilometres before she fell down. 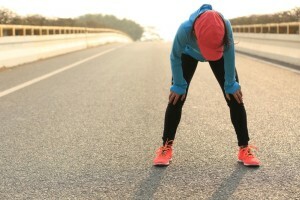 The runner says she suffered extreme cramping that caused her to slow to the point of walking, and eventually falling. Gollish ran strong today and finished in a very impressive debut time. The third Canadian woman across the line in the marathon was Kate Bazeley in 2:39:55. Unfortunately, US runner Kara Goucher didn’t finish Sunday’s race. Goucher reportedly dropped at 31K on 2:39 pace. Houston was the runner’s first marathon attempt in three years. Maybe it was the truly Canadian weather in Houston on Sunday, with windy conditions and temperatures hovering around freezing, but Canadian women are crushing distance running right now. Natasha Wodak was the first Canadian woman across the line Sunday morning in the half-marathon. Wodak was the 10th female, finishing in 1:10:33, which is a 47 second personal best and just 25 seconds off of Rachel Cliff’s Canadian record of 1:10:08 set early last year. She was followed by Dayna Pidhoresky in 1:12:59, just off her official personal best of 1:12:38 (she ran a 1:11:46 in 2011 but not in an IAAF legal race). Robyn Mildren followed her in 1:13:21. 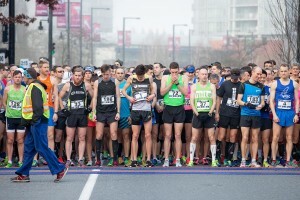 Canadian M40 marathon record holder Lyndsay Tessier was the fourth Canadian woman across the line in 1:13:54, which is a 35-second personal best. Recent Queen’s graduate and current medical school student Claire Sumner ran 1:14:48 and was the fifth Canadian woman across the line.